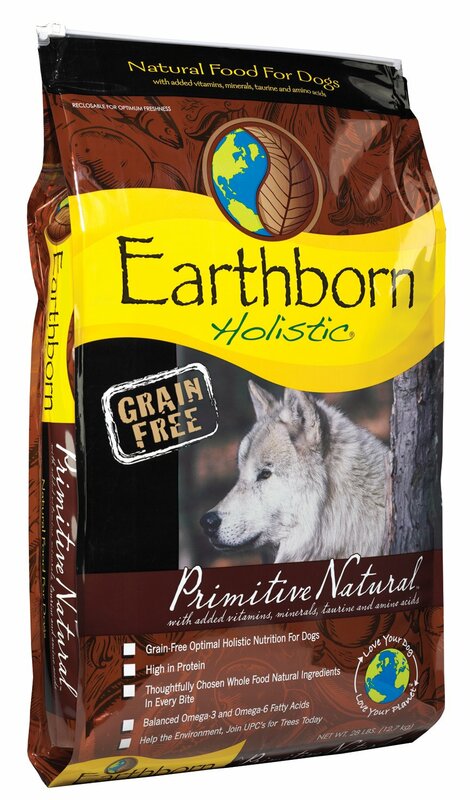 This company has taken our dogs back to their ancient roots by using only proteins found in the wild-meats. These include: bison, venison, lamb, salmon, boar and wildfowl. The meats are then roasted for flavor. 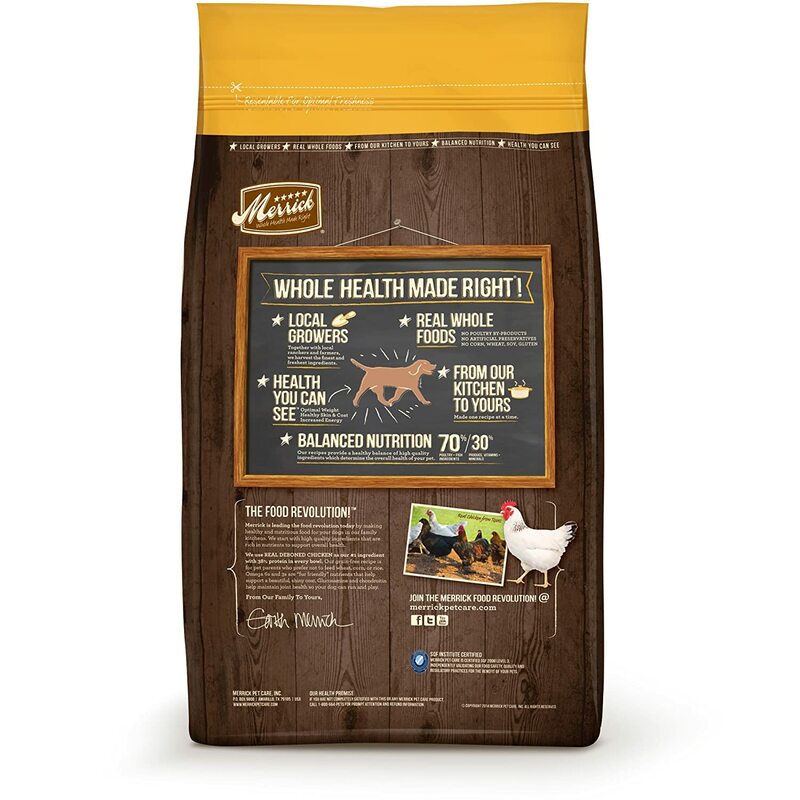 This grain-free dog food also uses this highly digestible protein to support healthy muscle development and to provide those essential amino acids. The wild proteins also provide your dog with more flavor options as well as being a diet that is dictated by its genetic-makeup, not by a laboratory. This protein-rich dry dog food will provide your canine companion with optimal health benefits. The meat is sourced from the USA, with the exception of the lamb which comes from New Zealand. The blend also uses apples, carrots, blueberries, peas and spinach for a boost of antioxidants and fiber. 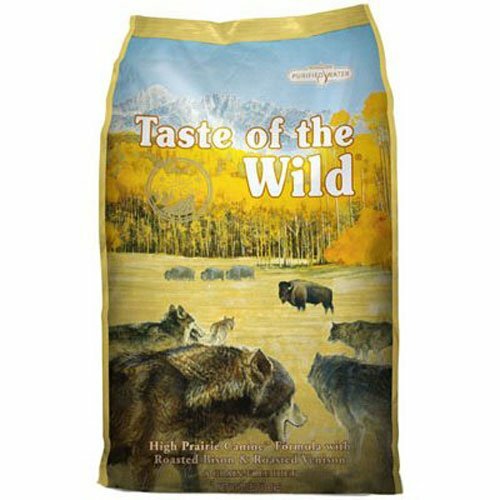 Made in the USA, this quality dog food only uses fresh deboned proteins in their recipes. 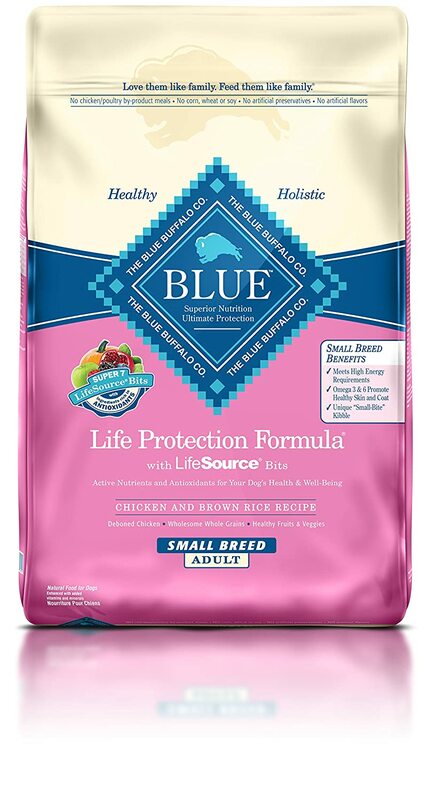 You won't find any by-products, meals or cheap fillers in Blue Buffalo. It also includes Life Source Bits (a special blend of antioxidant-rich ingredients) for added health benefits. In addition, this blend includes many natural greens for added fiber like peas, dried kelp and alfalfa. Life Source Bits tend to settle at the bottom of the bag. Be sure to mix thoroughly before serving it to your dog. With no ingredients from China, this quality dog food uses deboned fresh meats as its first ingredient. In fact, it contains a 70/30 split between identified meat proteins (to support lean muscle development) and fresh produce. 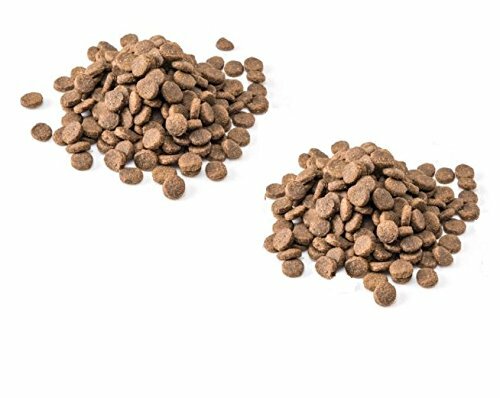 In addition, this dry dog food also adds Omega 6 and Omega 3 fatty acids for healthy skin and coat, as well as good levels of glucosamine and chondroitin for healthy hips and joints. This is our number one top pick for a healthy dog food. 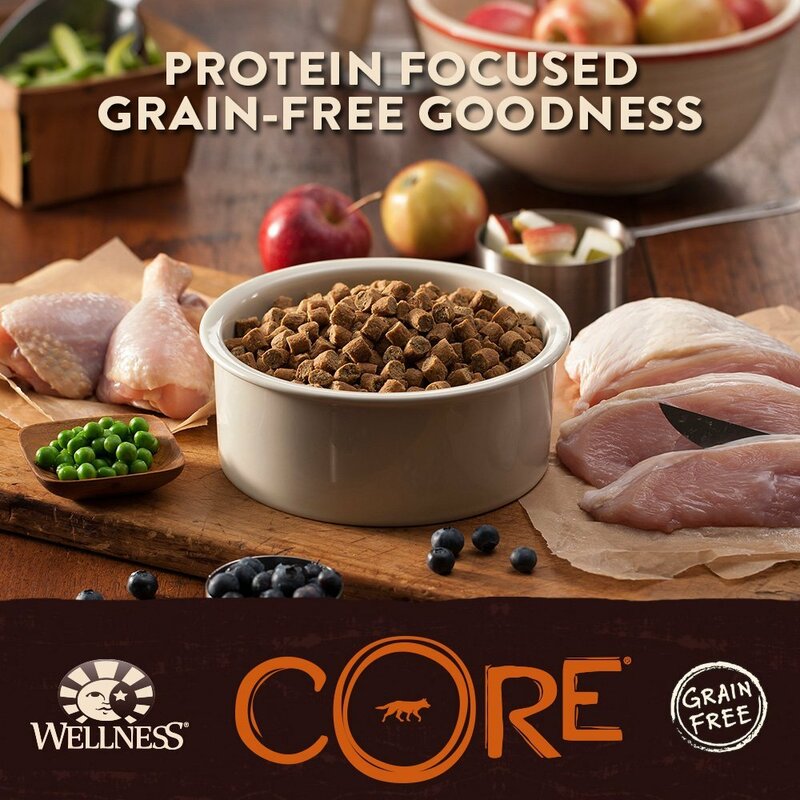 Wellness Core Natural Grain Free dog food is setting the standards for other brands by only using fresh meats as their first ingredient. The also include other added benefits of natural ingredients such as sweet potato, broccoli, kale, spinach, blueberries and pomegranates. In addition, all the ingredients and the manufacturing is done in the USA. First and foremost, dogs need a loving environment with a safe place to grow, play and sleep. Most pet parents already have this covered, but they may not know what ingredients dog food needs to contain to keep their canine companions in optimal health. Here is a list of the top ingredients that should be listed (in order) in a quality dog food (according to Dr. Karen Becker DVM). Meat is vitally important for your pet's muscle development and for the essential amino acids your dog's body cannot produce on its own. AVOID: Meat by-products as these can come from anything such as beaks, feathers, bones, feet, hair and even tumors that have been pulverized in the process. 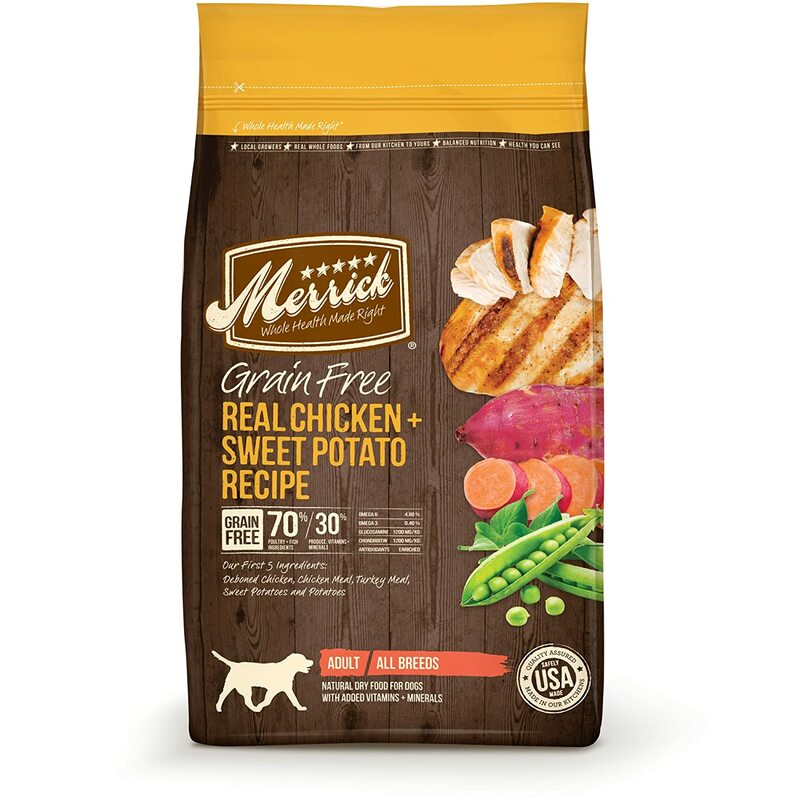 Meat meal found in dog foods are what is left over from cooking down the meat source. This provides a highly concentrated form of protein that is good for your canine. However, not all "meals" in pet food are created equally. High quality "meals" will be listed as an identified meat source such as chicken or beef-meal. AVOID: Meals that contain the words "by-products" or an unidentified meal source. These examples include "chicken by-product meals" and "meat meals." Although, our canine companions are primarily carnivores, they do need a certain amount of vegetables and fruits in their diets. 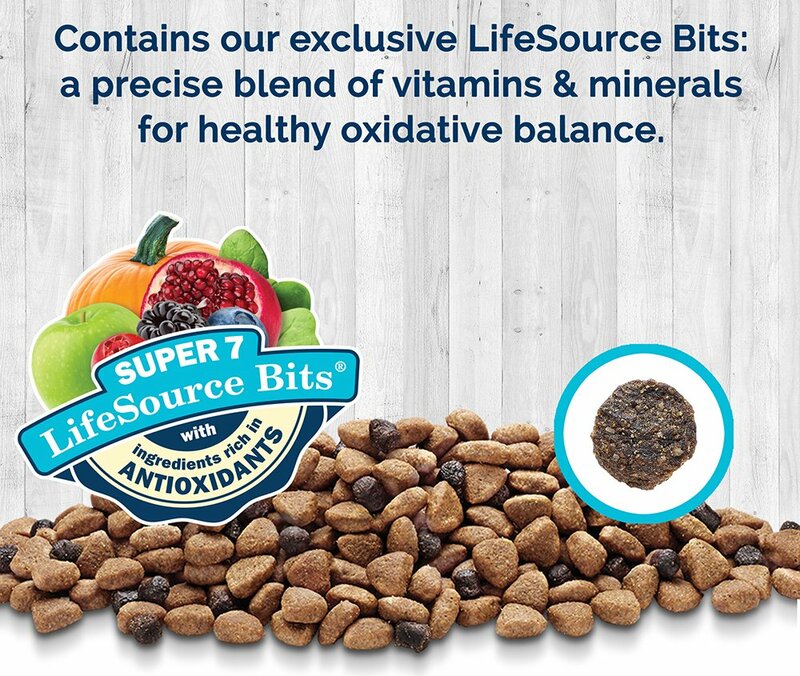 These wholesome ingredients such as blackberries and carrots provide your pet with added vitamins, minerals and antioxidants for overall health. Carbs get a bad rap in both the human and pet's diet. However, carbohydrates are essential for providing our pets with energy. AVOID: Pet foods that use corn, wheat or beet pulp. These are cheap fillers that bulk up the food with little to no health benefits. Artificial colors/flavors can be cancer causing in pets and are labeled as BHT, BHA, ethoxyquin and propyl gallate. Splitting is when one ingredient is labeled several times such as brown rice, white rice, rice gluten meal, rice bran. This takes up the bulk of the food and may be replacing the protein content. ​How to Select the Best Dog Food For a Golden Retriever? Should it Be Wet or Dry Food? The debate over dry dog food versus wet dog food as been going on for ages. There are both advantages and disadvantages of both these products. To help you decide which form of dog food is best for a Golden Retriever, we've put together a list of the pros and cons of each type. Some pet parents opt for both a dry and wet combination by mixing the wet food into their dog's dry kibble. This not only adds all the benefits of both forms of food, but it gives your dog a higher taste-profile. 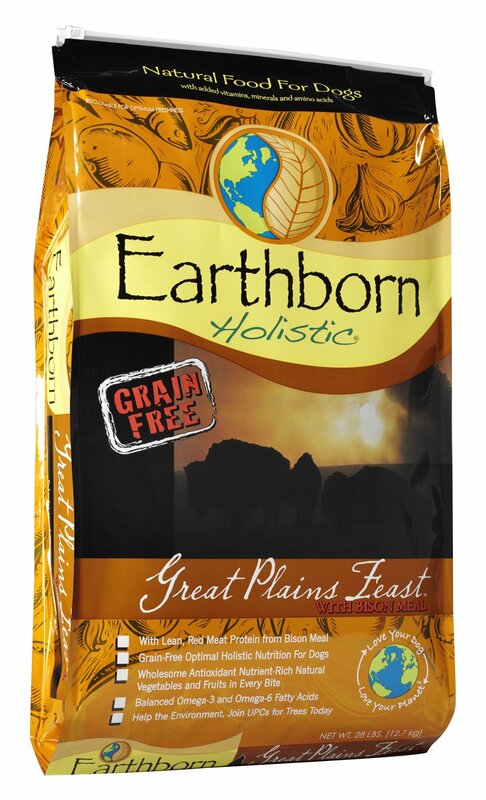 Should It Be Grain Free? There's a lot of talk about grains being bad for dogs. However, just like protein, not all "grains" are the same. Healthy grains for dogs include whole brown or wild rice, whole millet, quinoa (actually a seed) and whole oats. These ingredients will give your dog a healthy boost of carbohydrates for energy and some other added vitamins and minerals. Common poor quality grains used in many dog foods include corn and wheat. 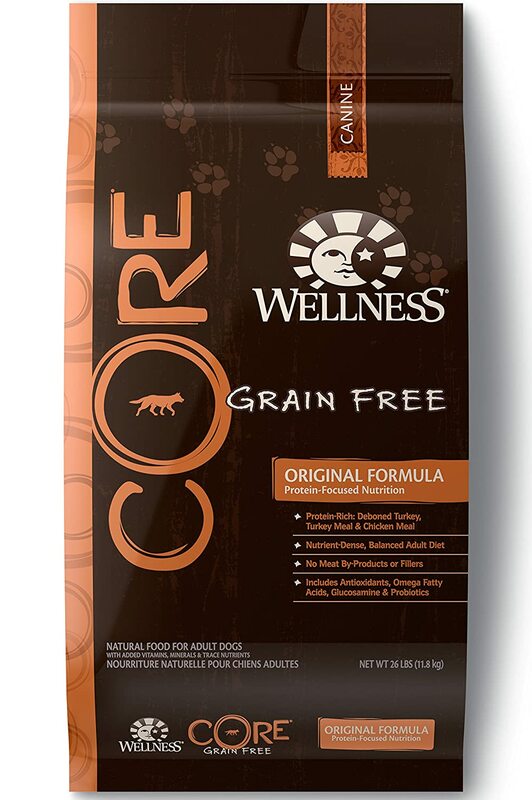 Although, these five foods are top-notch, you can see why we've chosen the Wellness Core Natural Grain Free Dog Food. 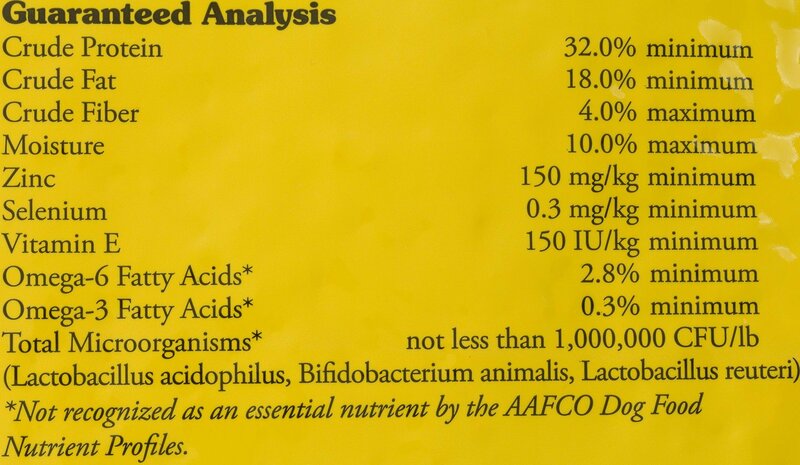 The many benefits and low cons make this dog food a healthy quality choice for a Golden Retriever and other canine breeds. However, not all dog foods may be right for all canines. Choosing the best dog food for your Golden Retriever may take some time, research and trial-and-error. Don't be fooled by the packaging or commercials on any brand of dog food. Read the labels to know exactly what you're feeding your dog. It will be well worth the effort when your dog is happy and healthy. What good is a healthy food if your puppy won't eat? This YouTube video gives us some helpful hints to get your pooch back to the bowl.